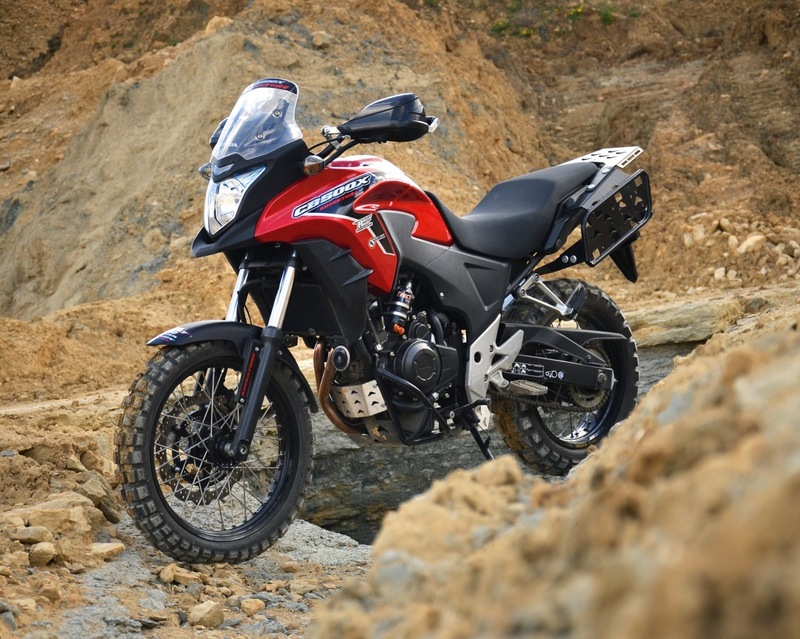 We received?the first shipment of Honda CB500X Adventure?Level 3 kits (suspension plus wheels) today from Rally Raid Products! If you would like to reserve your Level 3 Adventure kit, please understand that we are looking at approximately 3-4 weeks for?delivery of the next batch of wheels – but all other parts are available and ready to ship now. Rally-Raid Products Ltd are the UK distributor and nominated Service Agent for Tractive Suspension, with all necessary tools and equipment to offer buyers a complete technical service and repair facility. This includes stocking all genuine Tractive Suspension shock absorber spare parts, along with their own design of vacuum pump to enable the shock to be bled 100% when re-filling with oil. Standard ride height/travel RRP/Tractive suspension upgrade. Suitable for CB500X, CB500F and CBR500R.
? Fully re-buildable, in the event of servicing. Rear shock upgrade adds a remote reservoir with additional oil capacity and separate damping controls, featuring 100% independent high and low speed compression damping adjusters on the remote, and a dedicated 100% rebound adjuster on the shock body lower fork. This rear shock option will also come with a RRP mounting bracket for the remote reservoir. Complete kit raises the bike 2? front and rear, and in turn offers just a touch under 7? travel at both ends (same as a BMW F700GS, for example). A longer side-stand is also included to accommodate the 2? increase in ground clearance. Wheel set is not included.
? Adventure rear suspension linkage: Billet aluminium linkage bone and heavy-duty steel side plates to retain correct suspension geometry.
? Front forks: Replacement internal components – longer linear-wound Tractive springs (that eliminate the 6? OEM plastic spacer), Adventure +30mm travel RRP damper-rods with built-in shim stack valving, and adjustable preload fork caps.
? Adventure triple-clamp: 20mm stepped billet-aluminium top clamp incorporating Scotts steering damper mounting as standard, with adjustable bar/riser block (OEM 7/8″ included, or alternative 1,1/8″ high-rise Fat-bar).
? Replacement longer (+55mm) side-stand. Complete kit raises the bike 2? front and rear, and in turn offers just a touch under 7? travel at both ends (same as a BMW F700GS, for example). A longer side-stand is also included to accommodate the 2? increase in ground clearance. 17? rear and 19? front heavy-duty spoked wheels offer a wide choice of all-terrain and dual-sport tyres. Revised rear suspension linkage is not only stronger than OEM, but also retains the correct geometry for the longer travel suspension. Similarly at the front, the billet top-triple clamp is not only required for 19? front wheel clearance, but also offers adjustable bar positioning, a wider choice of handlebars (with optional Fat-bar clamp), and compatibility with a Scotts steering damper (sold separately).
? Rear wheel: 17? x 4.25 black powder-coated aluminium rim, heavy-duty stainless steel spokes and billet aluminium RRP hub that accepts the OEM cush drive, rubbers and brake components (including ABS where fitted).
? Front wheel: 19? x 2.50 black powder-coated aluminium rim, heavy-duty stainless steel spokes and billet aluminium RRP hub & dedicated disc spider that accepts the OEM brake components (including ABS where fitted).
? Dedicated 19? low front fender: Includes mountings to fit original fork legs.
? Our own design of heavy-duty footrests to suit the Honda CB500X/F & CBR models are laser-cut from stainless-steel to give a more comfortable ride, and better grip for the boots in off-road conditions.
? They retain the same height as the OEM pegs.
? 25mm wider and 25mm longer than cast-alloy OEM footrests.
? Uses OEM pin, circlip & spring.
? Supplied in pairs, left & right.
? In Black Phoscoat finish, very durable.
? Billet CNC machined adjustable fork pre-load adjusters to replace the OEM fork caps.
? These give up to 15mm adjustment on the for pre-load by the easy use of a 12mm spanner.
? Ideal for quick adjustment of fork pre-load to suit changes in riding conditions or luggage loading of the bike.
? Supplied silver anodised as a pair.
? Our own design of a welded steel tubular engine protector that uniquely mounts on the rear centre stand lugs and the front engine lugs on the frame, therefore minimising any stresses going through the cast engine cases, as is common with other engine guards.This means that big hits are absorbed through the frame, rather than the solid engine block.
? It also incorporates an integral 2mm steel skid plate, which extends up the front of the motor to offer protection to the very exposed oil filter, which is vulnerable to stone damage thrown up from the front wheel.
? There are also wrap around side bars to offer protection to the side cases, in the event of a fall.
? Also included is a stainless steel front plate to offer more protection from front wheel debris, and a stainless steel heat shield for the catalytic converter and lambda sensor, plus another stainless steel cover for the shift lever side.
? The welded assembly is powder-coated satin black and the stainless steel covers are brushed finished.
? Unfortunately, it is not possible for the centre stand to be retained with our Engine Guard.
? CNC machined from solid billet aluminium, this is a direct replacement for the cast alloy OEM part, but with 20mm dropped fork clamps, which allow the front of the bike to be lifted 20mm, on our adventure kit, or the fork legs can be slid through 20mm for those riders retaining the cast wheels, to keep the same ride height.
? The Billet Bar Risers maintain the OEM bar height.
? Another feature of the billet triple is the addition of a set of reversible bar risers which give the choice of 2 bar positions, forward or back.Also included is a billet Top Clamp to give maximum rigidity, and this also incorporates a set of M4 screw holes to either fit a powered Garmin Rugged Mount (RRP 329) or Garmin Std Mount (RRP 331) , or the circular or triangular RAM ball mounts.
? The top triple also has a pair of M6 threaded holes to fit a Scott’s/Ohlins steering damper (RRP 031), if required.This will be available separately, along with a custom damper pin mount.
? Also available, separately, is a laser-cut stainless steel plate (RRP 456) that can accept 12 volt cigarette type socket or USB socket, ideal for charging appliances, such as GPS or mobile phones, I-Pods etc.
? All CNC machined parts are hard anodised black and come complete with all fixings required.
? Another feature of the billet triple is the addition of a set of reversible bar risers which give the choice of 2 bar positions, forward or back.Also included is a billet Top Clamp to give maximum rigidity, and this also incorporates a set of M4 screw holes to either fit a Garmin GPS mount directly, or the circular or triangular RAM ball mounts.
? The top triple also has a pair of M6 threaded holes to fit a Scott’s/Ohlins steering damper, if required.This is available seperately, along with a custom damper pin mount.
? Also available, separately, is a laser cut stainless steel plate that can accept 12volt cigarette type socket or USB socket, ideal for charging appliances.
? Another extra addition is the choice of a separate set of bar risers that are designed to fit Fat Bars, 1 1/8″ diameter. We have designed these to work best with the RC bend Renthal bars.
? Our own design of a specific solution for those riders wishing to carry soft luggage on their travels, whilst retaining a slim, minimalist look when no luggage is attached.
? Manufactured from 16mm steel tubing and our tried-and-tested bespoke side panels that incorporate fixing holes for Rotopax fuel and water container mounts (maximum 1 gallon Rotopax canister), along with webbing slots to secure most soft luggage straps.
? The soft luggage racks work very well with Giant Loop Coyote and Mojavi saddlebags, Tillamook(38 litre) and Rogue(17 litre) dry bags.
? They also incorporate the fixing holes for our Rear Rack RRP 445, to give even more luggage options for long journeys.
? They also retain the use of the pillion footrests.
? Supplied powder coated satin black with all fixings needed for easy installation.Both rear OEM cast grab handles need to be removed.
? A laser cut stainless steel protective guard for the exposed rear plastic brake reservoir.This can be subjected to quite a lot of spray and stone throw from the rear wheel when riding on trails.
? Easy to fit, no extra fixings required.
? For those who wish to use the Rear Rack RRP 445, without the Soft Luggage Racks RRP 440, these dedicated 4mm thick steel mounting brackets replace the OEM grab handles and allow you to mount the Rear Rack directly to the bike. Powder-coated satin black.
? Laser cut from 4mm steel and powder coated satin black, this rear rack offers an amount of extra luggage space to the rear in a slim, low package.
? Designed primarily to work with our Soft Luggage Racks RRP 440.But it can be used on its own, but needs our Solo Rack Mounting Kit RRP 444, available seperately.
? It is specifically designed to accept the Giant Loop Klamath Tail Pack, ideal for storing easy accessible items.
? It is not designed to mount a top box on, and the OEM cast grab handles will have to be removed.
? Complete with all fixing screws.
? 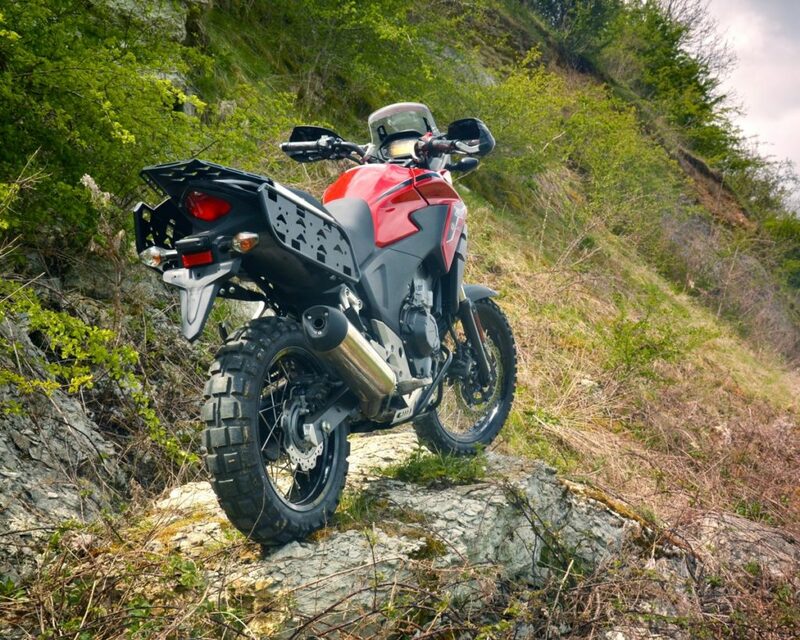 Our own high-quality graphics to suit the Honda CB500X and F, with our without our Adventure kit fitted.
? Reverse printed so very resistant to scratching and washing.
? A pair of billet aluminium 6082T6 adjustable brake and clutch levers to suit Honda CB500X/F & CB500R from 2013-on.
? 6-position adjustable, black gloss anodised with stainless-steel fasteners.
? Clutch 30mm shorter than OEM length, front brake 18mm shorter than OEM length.
? Our own design of laser-cut steel spanner with a 24mm hex to fit rear wheel nut and 17mm hex plug to fit the special recessed front wheel spindle.Zinc passivate plated for corrosion resistance.Also, there is a 6,4mm spoke key adjuster in one end to keep spokes on our Adventure Kit at the correct tension.
? Very useful for removing wheels as there are no tools to do this in the OEM tool kit.
? Our own design of 3mm thick stainless-steel laser-cut spanner with 19mm hex at one end for rear wheel spindle head, and 12mm the other end for front fork pinch bolt, or Preload Adjusters (RRP 436).
? Very useful for servicing and maintenance, as no tools for this are supplied in the OEM toolkit.
? A laser-cut 1,2mm stainless-steel plate to fix to the Top Clamp of our Billet Bar Riser using M4 screws(supplied).
? This plate is designed to accomodate up to 2 charging sockets, either 12V cigarette lighter type(RRP 102), or 12V USB type(RRP 138).
? Ideal for charging GPS, phones etc whilst on the move.
? The 4 hole centres are also designed to accept either of the Garmin Montana GPS mounts.